Please do contribute, no matter what music you’re into and feel free to use the image above on your own blog post/sidebar! This time next week the first-ever Google Teacher Academy in the UK (#GTAUK) will be drawing to a close. I’m honoured to be one of the UK-based Lead Learners (along with Tom Barrett and Zoe Ross). Consider the blogs you’ve come across in 2009 that you like. Write about why you like them on your blog. Tag your blog post blogsilike and publish it. I really like Harold Jarche’s blog (http://www.jarche.com) and his work on the Sackville Commons. Inspirational stuff. After reading Seth Godin’s book Tribes I subscribed to his blog (http://sethgodin.typepad.com) via email. He is full of good ideas, that man! Some people who attend EdTechRoundUp regularly have begun to blog – people like Zoe Ross (http://www.zoeross.com), Nick Dennis (http://nickdennis.com/blog)and Kerry Turner (http://kerryjturner.com). Not have these three begun to blog to reflect on their own practice as educators, but are self-hosting their (WordPress-powered) blogs. Great stuff! If you want to do likewise, I highly recommend Bluehost to make it a simple, one-click process! 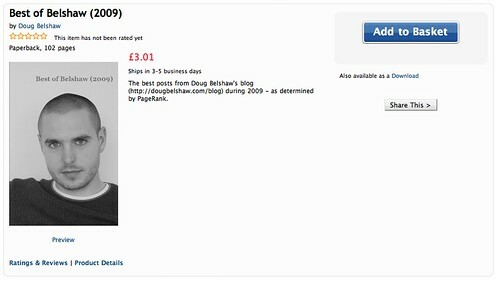 Last year I simply listed the ‘top’ 25 posts on this blog from the previous year in Top 25: the Best of Belshaw 2008. This year, I’ve gone one step further: I’ve created a book! The aim of this week was to ‘divest’ myself of unnecessary things. It wasn’t so much a move to live more cheaply or simply, but to establish a flow. Let me explain. Take, for example, books. I tend to buy quite a few, usually when I see them on offer or at a second-hand bookshop. I’ve a huge number of books I’m yet to read, but what of those that I have read and don’t love enough to buy in hardback? 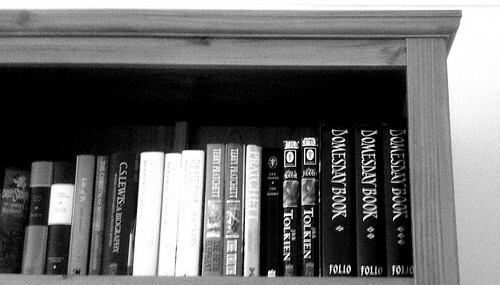 Previously, the languished on my shelves, taking up space just in case I ever wanted to read them again. Now I’ve got a flow. Books come in as they did before. Those that I love are bought in hardback. But those that previously languished now move on. To be sure, there will some that I’ll re-buy. But that’s worth freeing up a large amount of space for! I’ve kept about 15 DVDs. Most of those I haven’t seen, with only a few that I’m likely to want to keep on watching on a regular basis – North By Northwest, Monty Python & The Holy Grail to name buy two. I’ve decided to get rid of all of my CDs. Even the limited edition ones. The future is in services such as Spotify almost every track under the sun to wireless devices. I shall be investing the proceeds of my CD collection in buying a year’s Premium membership of Spotify. Many thanks to those who entered and for the kind comments about the existing content at http://elearnr.org. Additional thanks to those who have joined me on my journey this week. That word – ‘journey’ – is used all too often these days to make things sound more interesting than they are. Perhaps that’s the case here! But for me, this has been a truly important week in my life. A time when decisions were made, stuck to and carried through to their logical conclusion. Such ‘unorganized’ meetings of people – TeachMeet is a similar, slightly more structured example – are the subject of this blog post. What prompted my thinking about organization was part of the discussion we had, foolowed up by listening to a Radio 4 podcast on the way home called Thinking Allowed. I suggest that you listen to it right now! The whole point of organizations is to achieve something. These may be set in stone and known by all participants in the organizations, or there may be many (and possibly conflicting) objectives framed by participants. All organizations, therefore, have different degrees of productivity, both globally (as an organization) and, depending on their size, on a more micro-scale. I say this because we discussed at the tweetmeet – which was itself a kind of exemplar – the concept of an ‘unconference’. This is defined by Wikipedia (as I write, anyway…) as ‘a facilitated, participant-driven conference centered around a theme or purpose.’ Our purpose, I suppose, was to discuss things face-to-face that we’d previously discussed online, and to get to know each other a little better. Then, on the way home, listening the Thinking Allowed podcast (above) it got me thinking more generally about organizational structures. Michael Thompson, author of Organising and Disorganising, talked about going on a expedition to climb the South face of Mount Everest. He explained how there were two separate groups – ‘Team A’ and ‘Team B’ – with the leader and middle managers (as it were) in the former group and the rest in the latter. He explained how this rigid hierarchical structure led to those in Team B, despite being experienced and highly-motivated mountaineers, adopting a chaotic, somewhat anti-organizational structure. The important thing, however, was that order in fact came out of this structure; order that depended on those involved. This is the thing that is missing in organizational planning these days: the role of individuality. Because, actually, someone who fulfils a role in an organization cannot simply be swapped-out for another person. The whole organizational structure depends on the talents, personality and individual attributes of that person. Change one part of the organization and the whole thing shifts. It may be a small amount in some cases – imperceptible to some – but a rearrangement and alteration does take place. This helps to explain why organizations seemingly consisting of brilliant minds that should be amazingly productive and innovative fail to be so. An effective organizational structure is one that removes barriers and enables individuals within an organization to reach his or her potential. This, of course, cannot be at the expense of another, otherwise it is a futile exercise. One such way of going about organization, therefore, is to unorganize things, to mix things up a little. * I knew Lisa Stevens originally from last year’s TeachMeet at BETT, Jose Picardo from an Open Source Schools event, and Tom Barrett from some work we did for a Becta-funded project into Web 2.0 in the classroom at Nottingham University a few months back. The reason it says #tweetmeet in the title is because on Twitter you can add tags by prefacing words with hash symbols. These then can be tracked by websites such as Twemes.com. You can see this in action on the front page of the tweetmeet.eu website! Whilst there have been many blog posts and wiki pages dedicated to the ways in which laptops and Netbooks can be used in a 1-to-1 environment, it’s less obvious what you can do when you only have a few in your classroom. This presentation, as an ongoing project, should hopefully remedy that! Look at the presentation above to see what tips have already been added. Send a message on Twitter to @dajbelshaw, or use the contact form on this site in order to request to be added as a collaborator. Add a slide in a similar fashion to the ones already there, making sure you credit any Creative Commons-license images used. Change the number of tips now included in the presentation on the first slide, and add your name as being a collaborator. How to use Google Earth more effectively. Google Earth is a fantastic, FREE, tool for teaching and learning. There are many, many different ways of using it. It’s almost as if the whole world is a canvas! As befits Google Earth, the following are some ideas from educators around the world as to how to use the program effectively.